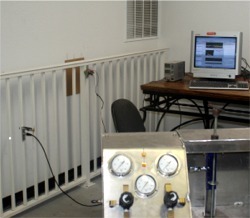 Welcome to our Research and Development Page. Here we will explain how the wind blowing causes that awful sound you heard. The Sound you heard is a wind induced noise. Note how the sound levels vary as the wind gusts. High rise condominium balcony railings exposed to coastal winds are more likely to experience wind induced noise than inland condo balcony railing where the wind is broken up by the surrounding buildings. Everything Vibrates, that's the basics. You may not feel it, you may not see it, but everything vibrates. This is called "Natural Frequency" its normal and cannot be stopped. Everything has its own Natural Frequency; Ocean Waves, Wind, even Stone or Concrete Rocks. Your Balcony Guardrails also have their own Natural Frequency. Railings noise is caused when the Natural Frequency of the wind beating against your rails Resonates with your Rails Natural Frequency creating Resonance Harmonics. There is additional information available from external links that will explain some of the terms and behavior discussed here, click on our Links page for additional information. What this means in plain English: The wind is not constant ... it "beats" or blows with a certain frequency, that frequency is dependent on variables including atmospheric conditions etc. The result is wind. 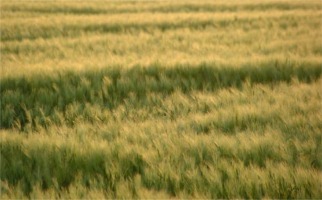 The Picture to the left illustrates this nicely, it shows the wind blowing waves of Wheat. Normally the energy is dissipated and there is no noise. However, when conditions are right, the wind speed is high enough, or from the right direction etc., the energy is not dissipated, rather the two frequencies (the wind frequency and the railing frequency) line up (get into phase) and reinforce one another. This results in stronger (greater amplitudenal) vibrations. The end result is that the railings begin to vibrate harder. This vibration acts just like an audio speaker and you hear that annoying sound. The chart below illustrates the phenomena. The above Graph is for illustration purposes only. It demonstrates how the two signals can line up, or fall "into phase" or "out of phase" thereby increasing or decreasing the strength of the vibration. The problems associated with calculating the frequencies involved is that the wind is never a constant and the railings are under the effect of the attached balcony/building either being damped or excited. So we have discussed Natural Frequency, Resonance, Harmonics, Amplitude and Phase. We now need to discuss the physical properties that determine Natural Frequency in solids, they are: Stiffness and Mass. The Formula for determining Natural Frequency is Fn= (1/2π)√(K/M) where K is stiffness and M is Mass. We have tested various methods using Lab View Signal Express software, accelerometers, and eccentric weight motors running on a variable speed DC motor controller which allowed us to fine tune the resonance signals. The Stiffer something is the higher it's natural frequency, the Heavier something is the lower its natural frequency. This reveals two possible solutions to the problem of noisy railings. 1. Increase the mass: This is commonly known as a Mass Damper or Tuned Mass Damper. The idea is that by increasing the mass it takes additional energy to begin the harmonic resonance into phase and that the railings will dissipate the energy before it reaches that point. 2. Increase the stiffness: This works by raising the natural frequency of the railing. This increases the ability of the rail to dampen vibrations as the frequency of phase is shifted higher and the opportunity of the railing to fall into and out of phase increases. Keep in mind we are simplifying things a bit here because there are so many different variables that can influence the vibration and the resonance, Wind speed, Wind frequency, the inherent vibrations of the structure to name a few. We have there fore focused on those things we can control. Check our products & services for more information on our solutions, both alter the stiffness and mass.